The Illusion of Life: Painting of Spots Huge Job in Producing Disney's "Dalmatians"
Painting of Spots Huge Job in Producing Disney's "Dalmatians"
The painting of spots was one of the biggest creative factors facing some 150 artists during three years of working on Walt Disney's cartoon-feature comedy-romance, 101 Dalmatians. In all, there are exactly 6,469,952 spots on the back of 101 heart-warming dogs and puppies as they appear in 113,760 frames of brilliant color by Technicolor. 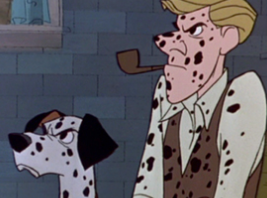 Pongo, the cartoon canine lead, wears 72 spots while his love, Perdita, has 68 on her coat. The spots and all other color effects required 800 gallons of very special paint weighing nearly five tons, enough to dress the exteriors of 135 average homes. Using a secret process, the studio has always mixed its own color in its own laboratories for all Disney cartoons. For 101 Dalmatians, 1,000 different shades were produced, 100 of them especially for that picture to achieve the subtlety and variety needed to handle the dogs and humans as they move through interiors and exteriors in summer and winter. Producing the "white" for the dogs alone— Dalmatians are white under the spots— required enough very light gray paint to make this category the predominant one in the picture's broad spectrum. Pure white, of course, would have been too garish, too difficult to define, especially against snow. From the 101 Dalmatians 1979 re-release press materials.